I imagine that this what it feels like for kids who put all kinds of craziness on the internet for the whole world to see. For example, the girl who thinks it’s cute to share a picture of herself half-naked on Facebook until everyone is whispering about it and forwarding it to all of their friends. Or the boy who uses an obnoxious username until he is totally embarrassed when a parent or teacher finds out he’s referring to himself as “mr_sweetcheeks” on Twitter. 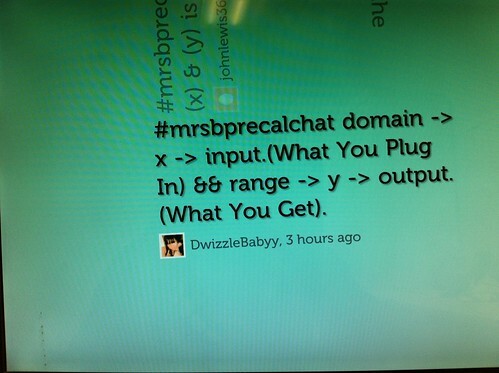 Today, I did my first “tweetup” in class, allowing students to answer a question I posed about math using tweets compiled with the hashtag #mrsbprecalchat. The activity went off pretty well, and the kids seemed to enjoy it. Nevertheless, despite my warnings, I was still bombarded with a slew of inappropriate usernames and profile pics. I would share a few here, but I really want to stay employed. I think you can use your imagination to figure out some of the faux pas I witnessed on my projection screen today. One advantage of using Twitter instead of a polling service like Poll Everywhere, which I discussed in yesterday’s post, is that there are no anonymous tweets. If a student decides to make an off-color comment, I can identify who it came from pretty easily. I had every student submit his or her Twitter username to me on the first day, so I know who’s saying what. I spent a little time after classes today sending some friendly reminder emails to students who needed to “clean up” their profiles in order to participate in our tweetups. I even offered them the option of simply creating a special Twitter for our class, as I am not here to police their personal social networking. Previous Previous post: I “polled everywhere” today! Next Next post: I’m overwhelmed.